When Lorraine and Stephen Lovell called in their plumber to change a radiator the last thing they expected was that he would uncover a deeper problem. As he removed the radiator from the wall in the hallway of their home in Burton Latimer, Northamptonshire, and checked under the floor boards he caught a whiff of a smell that should not have been there. This triggered an emergency repair response, with UKDN Waterflow (LG) Ltd at its centre, which greatly impressed the Lovells in terms of its speed and co-ordination. Lorraine, a retired school secretary, said: “We knew that there were sewer pipes running under the hallway, and that something was wrong. We weren’t sure what to do, so we called a builder friend to have a look. The Lovells’ insurance company confirmed they did have cover for drainage repairs, and a team from UKDN Waterflow (LG)’s Birmingham depot was assigned to investigate the precise cause of the bad smell. The CCTC drainage survey revealed that the foul pipe under the house had become cracked in several places. 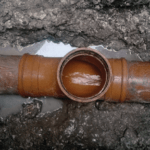 The solution was to install a glass-fibre liner impregnated with resin insider the pipe along a length of about 4 metres. Once it had hardened, the pipe was as good as new. Not only that, the CCTV survey had found a second problem with a junction between two pipes under the garden, so the UKDN Waterflow (LG) team excavated that, and replaced that section of pipe as well. Lorraine said: “The service was amazing. The UKDN Waterflow (LG) customer service team was fantastic as well, because they moved the repair date at the last moment so an electrician could do some work first.